The duplicate of the microfilm archive films are supplied in cartons. The MFA produces working films on demand. For information on interlibrary loan, please contact your local library or archive, or the Institute for Newspaper Research (Institut für Zeitungsforschung), Dortmund. Customers who wish to purchase duplicate microfilm must order their copies directly from the MFA, which will organise production and delivery. The office of the MFA is staffed on Fridays from 8 a.m. to 4 p.m. by Magdalene Arlt and Harald Bader. Microfilm can be ordered by letter, email or fax. If you have any questions concerning an item you are interested in, please contact our office. 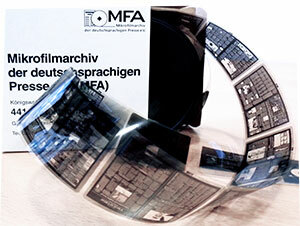 Within Germany, working films cost €45 per roll inclusive of postage and packing. They hold approximately 600 images, which is roughly equivalent to two newspaper pages. The base price per roll is €35 for subscribers. Members receive a 10% discount on all orders. All customers receive a 5 % discount on individual orders over € 500. These charges also apply to customers from other EU countries but additional postage costs will be payable. Please contact us for prices of packages overseas. Due to the MFA’s status as a non-profit organisation VAT is not charged on duplicate films. The office of the MFA is housed within Dortmund’s library complex (Haus der Bibliotheken). The postal address is Max-von-der-Gruen-Platz 1-3, 44122 Dortmund, Germany. The office is staffed on Fridays from 8 a.m. until 4 p.m. and Magdalene Arlt and Harald Bader will be happy to help you with your inquiries and take your orders. Hannelore Loviscach is the contact persons for invoices. You can get in touch by telephone, email or letter.